Most often you may have prints and no negatives. But sometimes you find some precious negatives. It’s usually quite difficult to see what’s on them. Many people are overjoyed when they see the images after they have been scanned – often photographs they have never seen before and can be truly treasured as well as being able to be printed and enlarged. We can scan, in high resolution, large format negatives such as 6cm x 9cm, 35mm negatives, 126 Instamatic negatives, 110 negatives and even Kodak Disc negatives. 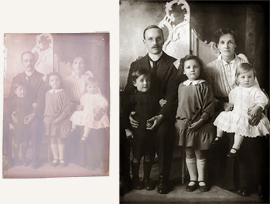 We can also scan glass negatives. It’s usually easiest in the case of negatives for us to send you the scanned image (as a positive image) so you can see it and decide if it needs any restoration work carried out. Many people have a great collection of 35mm transparencies/slides and no longer have a projector or don’t want the hassle of setting up a projector and screen. It’s worth going through your slides and picking the best for scanning, restoring, cropping and making prints or enlargements. We have special rates for bulk scanning or you can just have a single slide scanned if you prefer. Slides deteriorate if not stored well. We often come across ones that have spidery mould growths on them due to damp or otherwise poor conditions. Check them out and save them now! Don’t delay – act today.